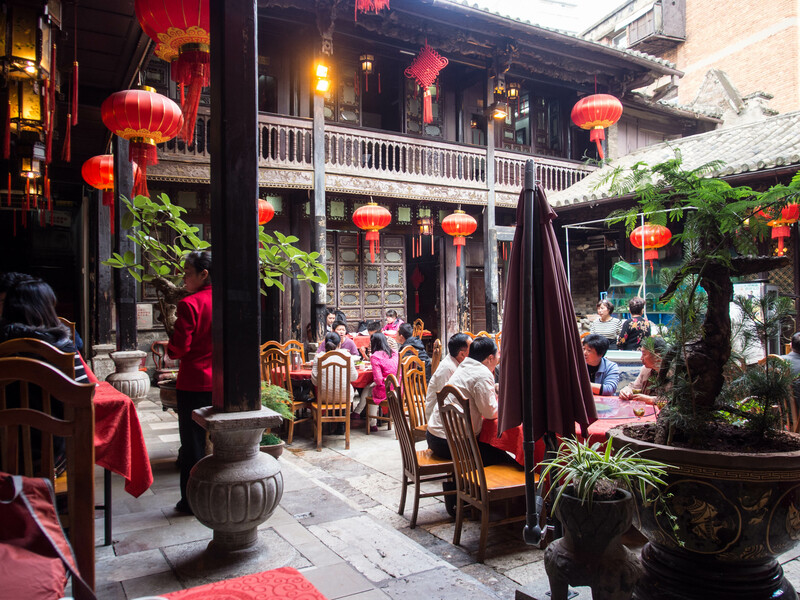 One may not think of Kunming as a culinary hotspot, but it does have some very good restaurants. 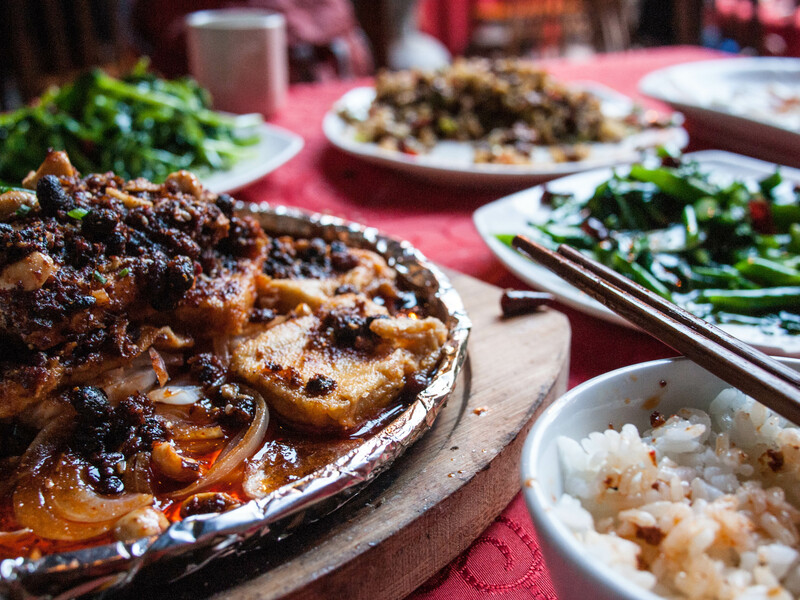 The food has a definite Sichuan influence with the liberal use of chili peppers and some Sichuan peppercorns, but it is not as spicy as mainstream Sichuan cuisine. Another wonderful thing about Kunming, and Yunnan in general, is the ethnic minority populations. 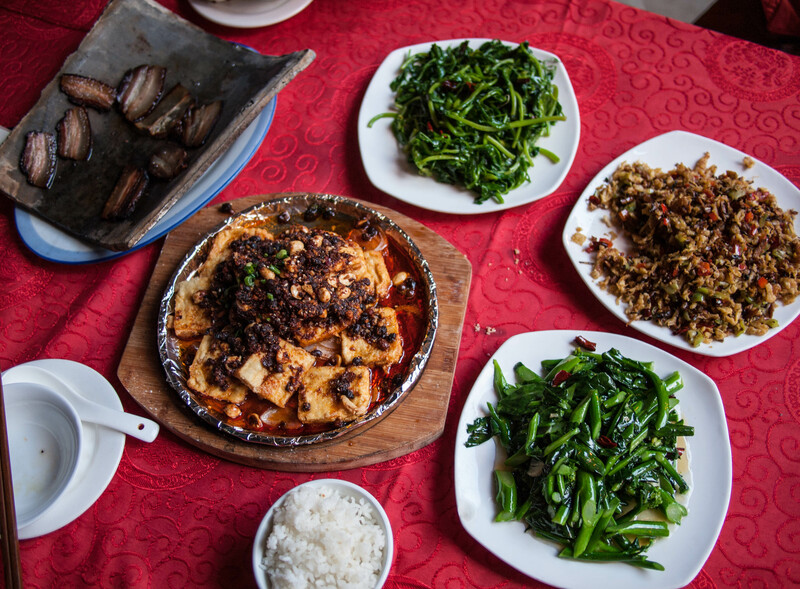 The unique cuisines of these various groups have found their way into Chinese cooking to give it some interesting and delicious variations. 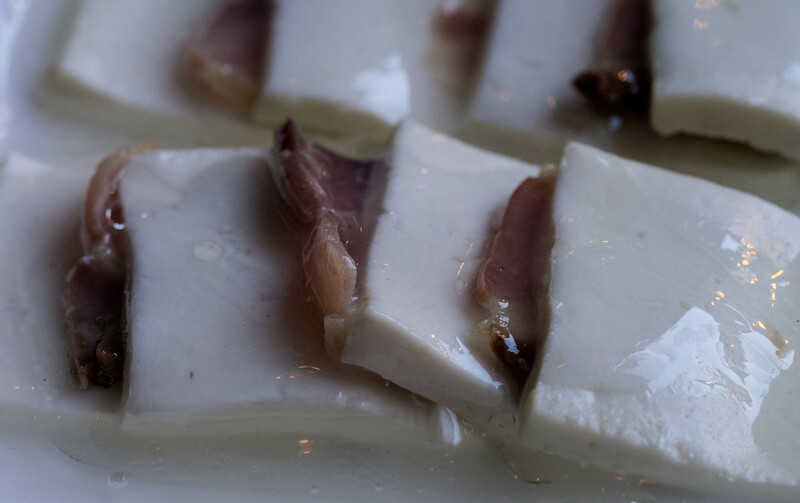 For example, one does not think of cheese in Chinese cuisine, but it can be found in Kunming, and is probably an influence from one of the ethnic minority groups. One night my friend and colleague Michael and I found a superb restaurant in Kunming. 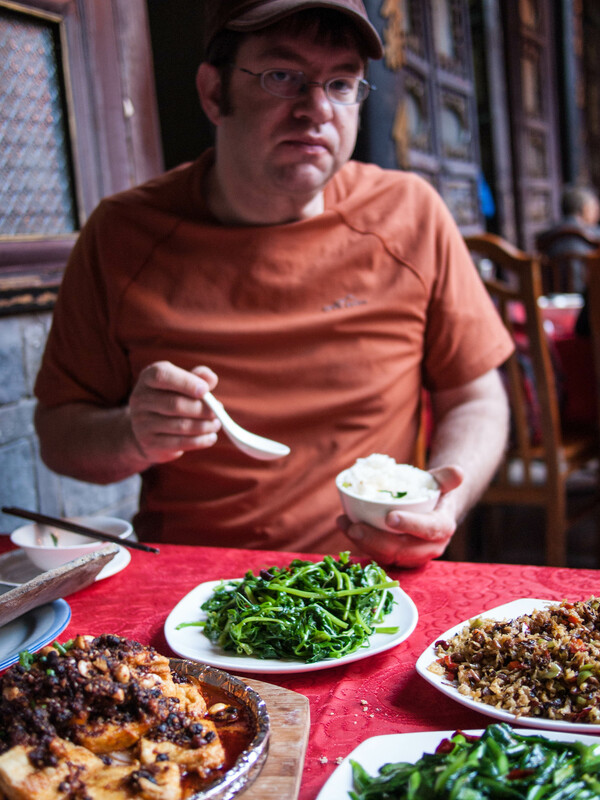 We were there doing research on Sichuan cuisine and the many variations to it in the surrounding areas. I think we found this restaurant on a Chinese food blog or forum. 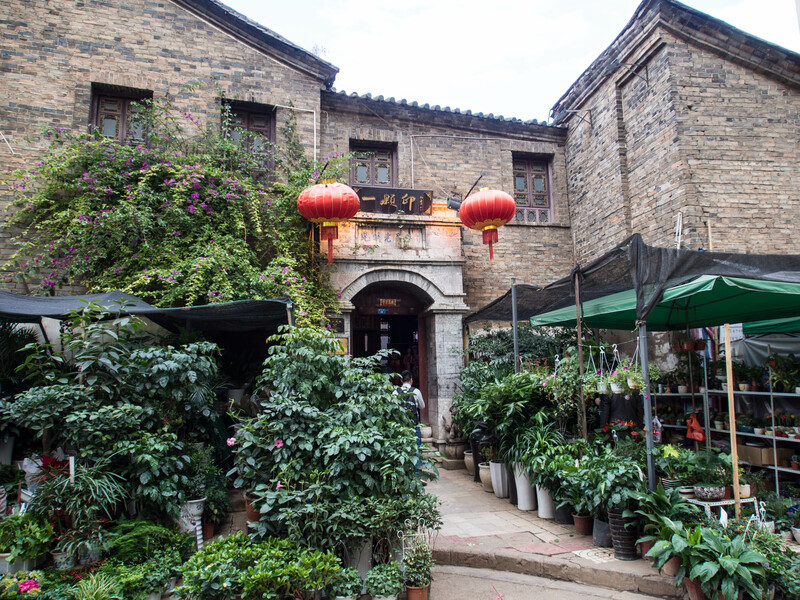 It was called, 一颗印昆明老房子 yì kēyìn kūnmíng lǎo fángzi and was in an old courtyard style house tucked away in a back alley. The house was more than a hundred years old and had an historical plaque out front. People seem to eat early in Kunming; the restaurants empty out by about 8:30 pm. We thoroughly enjoyed sitting in the courtyard on a beautiful clear day, about 70 degrees, blue skies with a few white puffy clouds. The restaurant was very crowded, as good restaurants usually are. Our practice when visiting a new restaurant is to talk to the server about their speciality dishes. In other words, what are the dishes that the restaurant is known for. We also try to get a sense for the local food scene. Our server at this particular restaurant was pretty helpful. At one point she called another girl over to help answer our questions. We wanted to order local specialties and were not disappointed. We ordered six dishes. Pork belly on a hot curved tile. 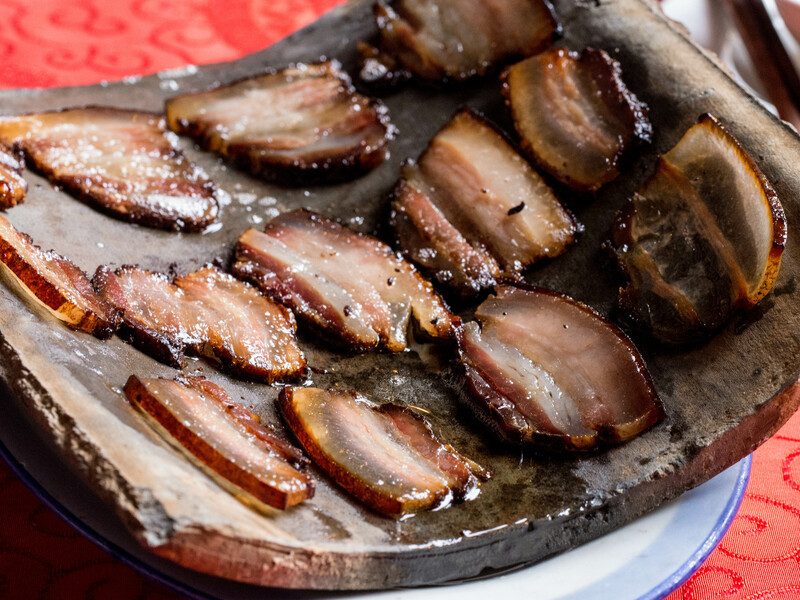 Yunnan is famous for their hams, and I suppose this dish follows in that tradition. This fatty pork had a deep, smoky flavor similar to bacon. But it was not as salty and had a more “wild” flavor than the bacon we eat here in the U.S. It was fatty and rich, and was served, and probably cooked, sizzling on a hot curved roof tile. This was a great dish, not typical of many Chinese dishes. 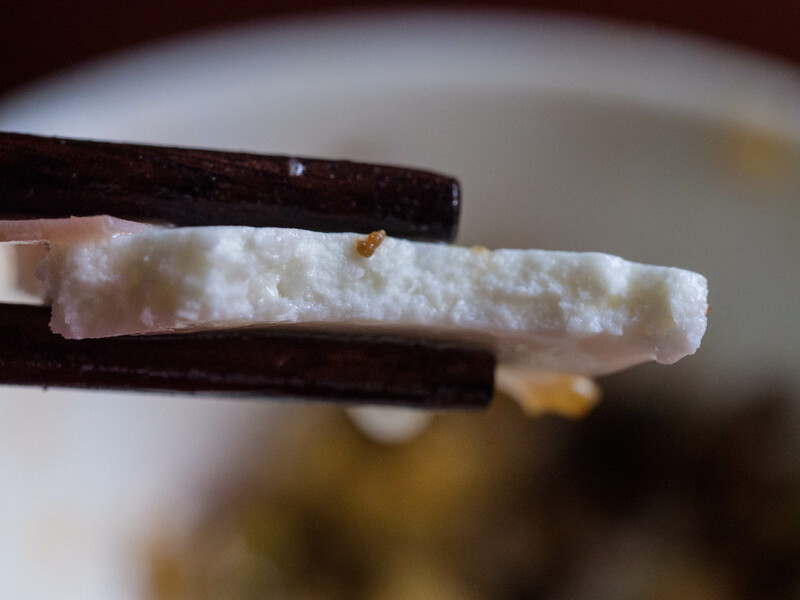 This is the first time I have eaten cheese at a Chinese restaurant; I have eaten yak cheese in other parts of Yunnan and in Tibet, but that was Tibetan food, not Chinese. This was a unique dish with tender slices of salty, flavorful ham with a mellow, fresh white cheese. The cheese had the consistency of a fresh mozzarella, but a little firmer, and was quite tasty. I’m not sure how popular this dish is with the Chinese, but we really enjoyed it. This was a fried tofu dish served on a hot iron plate. I really don’t know what the 包浆 bāojiāng in the name of this dish refers to. 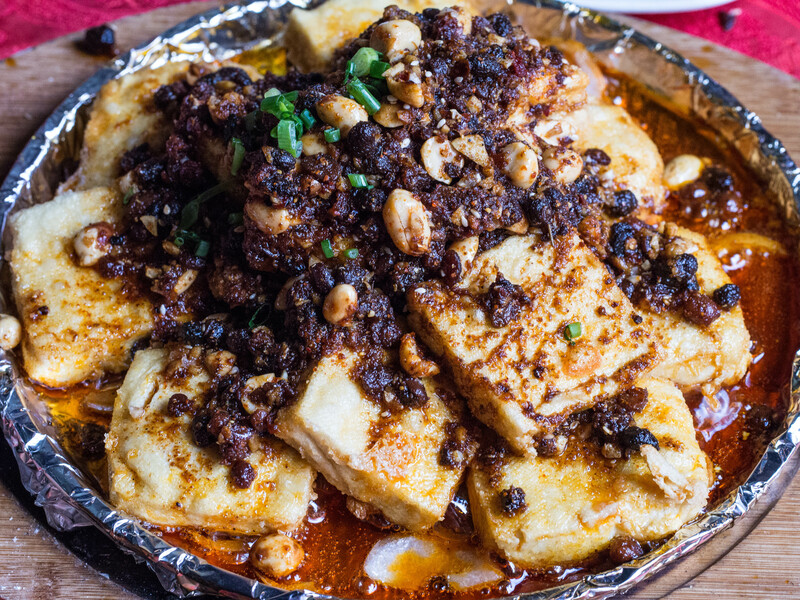 The tofu was firm and chewy on the outside and soft on the inside as a result of being fried. 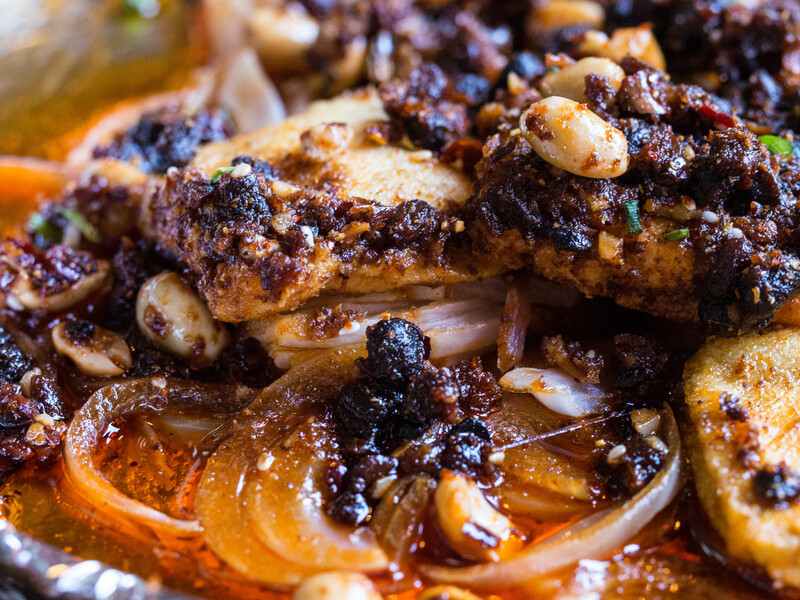 This dish also had a delicious sauce made with fermented and seasoned soybeans 豆豉 dòuchǐ (see this post for more on this wonderful seasoning: https://intothemiddlekingdom.com/2014/01/27/spectacular-meals-guiyang-%E8%B4%B5%E9%98%B3/). Seasoned and fermented soybeans are a wonderful mix of chewy and crunchy with an earthy, salty taste. They go well with the blandness of tofu. The tofu was served on a bed of sauteed onions. I am huge fan of tofu and 豆豉 dòuchǐ, so I really loved this dish. the flavors were complex and the tofu was cooked to perfection. I especially like tofu that is fried like this as it gives it a nice meaty texture. Onions, fermented & seasoned soybeans, and tofu. I love eggs in any form, especially in Chinese food. The Chinese use eggs quite frequently in all the different kinds of regional cuisines. This was an excellent dish. I’m not exactly sure what the “grandmother’s vegetable” refers to in the Chinese name of this dish. This particular dish had little bits of seasoned pork, some fermented soybeans, some bell pepper, and of course scrambled egg. It may be that this is one of those dishes where you can throw in whatever vegetables you may have on hand. This dish was very flavorful, probably due to the pork and soybeans. 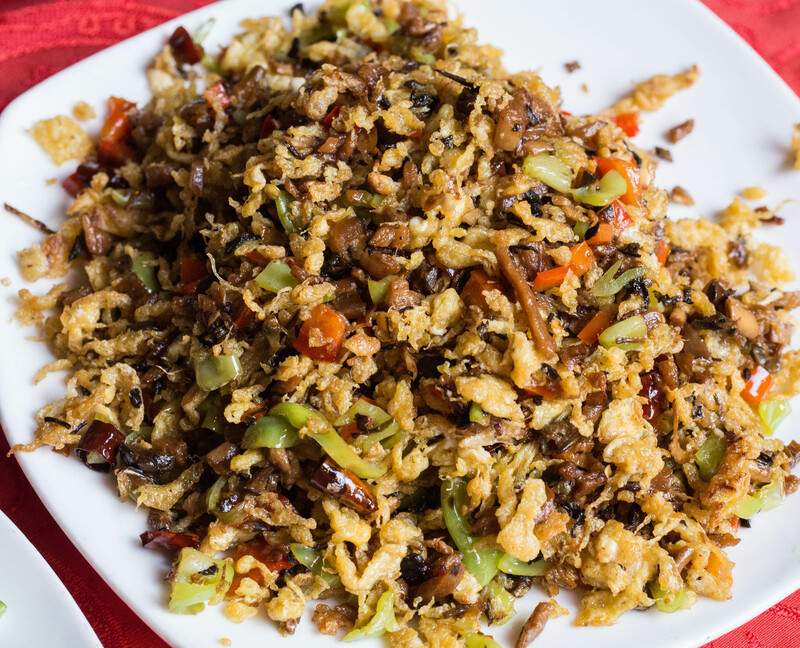 Chinese style scrambled eggs with pork and vegetables. 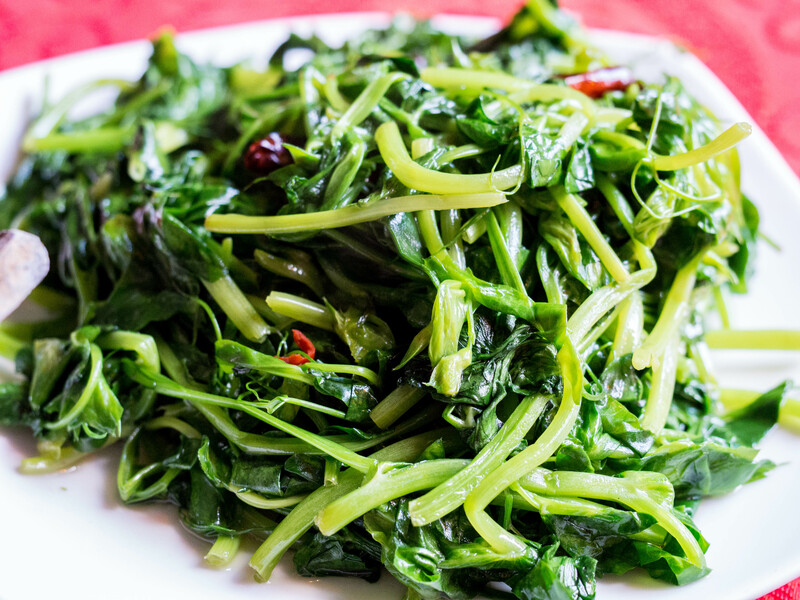 Chinese broccoli or mustard greens. 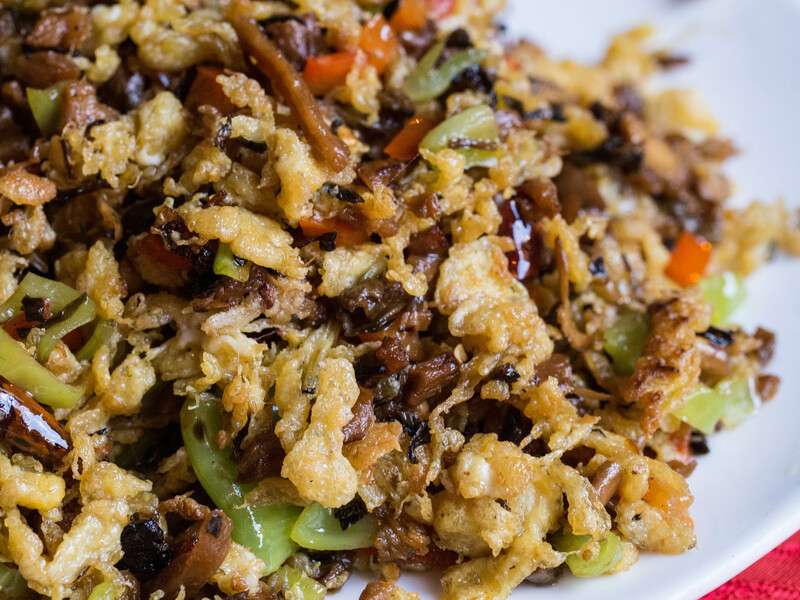 This is a pretty basic dish that you can find just about anywhere in China. This particular version was cooked with garlic, dried red pepper (the Sichuan influence) and some small bits of mushroom. Nothing extraordinary, but quite good. A type of bean sprout? This was a local vegetable, which based on the name, is probably some kind of a bean sprout. Again, nothing extraordinary, but very delicious. 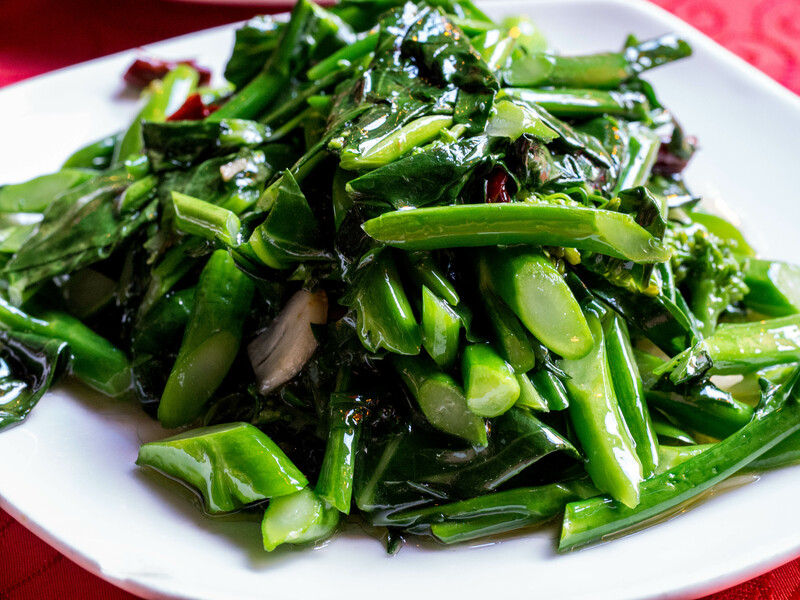 No Chinese meal is complete without some good stir-fried greens. This was one of those spectacular meals that I have eaten in China in the past couple years. One of the things that made it so good was the variety of the dishes and the uniqueness of the local flavors. If I were ever back in Kunming I would certainly go back to this fine restaurant. My research companion deep in his work.